Parc La Fontaine's charm in the skating department? The park's characteristically long, meandering ice paths which are essentially frozen waterways, ponds that permeate La Fontaine`s ground year round. In my seasoned opinion as an experienced skater, gliding down a frozen waterway offers an experience you just can't get with skating round and round in a standard rink. Paths ripe with romantic appeal and family fun, hockey players are anything but left out, with Parc La Fontaine proposing two oblong-shaped outdoor arena rinks for the love of the game located away from the ice paths. Pro tip: consider an après-skate of Montreal's best poutine a two-minute walk from the either here or here after an afternoon on your feet. Both are roughly one block away from Parc La Fontaine. Outdoor skating season in Montreal is usually from mid-December to mid-March. And in the case of Parc La Fontaine, rinks should be open by the beginning of the winter holidays, if not by December 16, 2017 and should stay open until at least the first week of March 2018. But every ice skating season is contingent on weather conditions, which obviously vary by year. 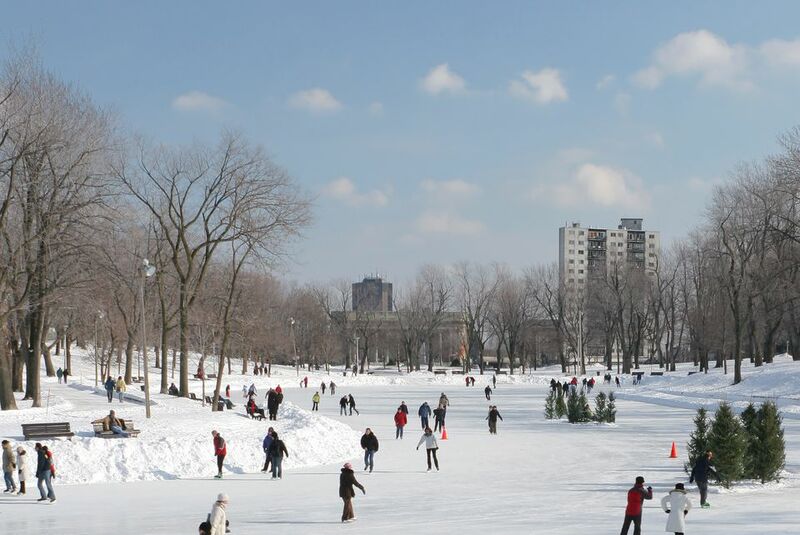 The 2015-2016 season, for example, was dreadfully short for Montreal's natural rinks like those at Parc La Fontaine due to a late winter onset and unexpected thawing trends cut the season so short, the rink was out of commission by February. So if you're planning a skate session before the end of December or after the first week of March (especially if you want to rent skates on location), do yourself a favor and call 311 before showing up at Parc La Fontaine to make sure the rink and rental office are open. And even if it is technically skating season, always check ice rink conditions online before heading out. Services: ice skate rentals for periods of one to 3 hours ($10), locker lock rental ($4), helmet rental ($4), skate sharpening service ($7). Blade protectors, gloves, socks and skate laces also sold on location. Cash only. All rentals require the handing over of either one's driver's license, a photo I.D. card or a monetary deposit ranging from $5 to $50 depending on the rental, all of which are given back upon rental return. Cash only. Note that prices are subject to change without notice. Also note that the rental office is closed on days where ice skating conditions are poor. Always check ice rink conditions online before heading out. Note that Parc La Fontaine's rental prices and hours of operation are subject to change without notice.